This article outlines the aims and objectives of the basin-wide Integrated Water Resources Management (IWRM) Plan development as well as how the work would be carried out through a combination of consolidation of technical studies and stakeholder consultation. During the development of the IWRM Plan it is ensured that the key basic elements are agreed up on by ORASECOM before following steps are taken. The proposed approach for building the plan is shown in the flow chart below. 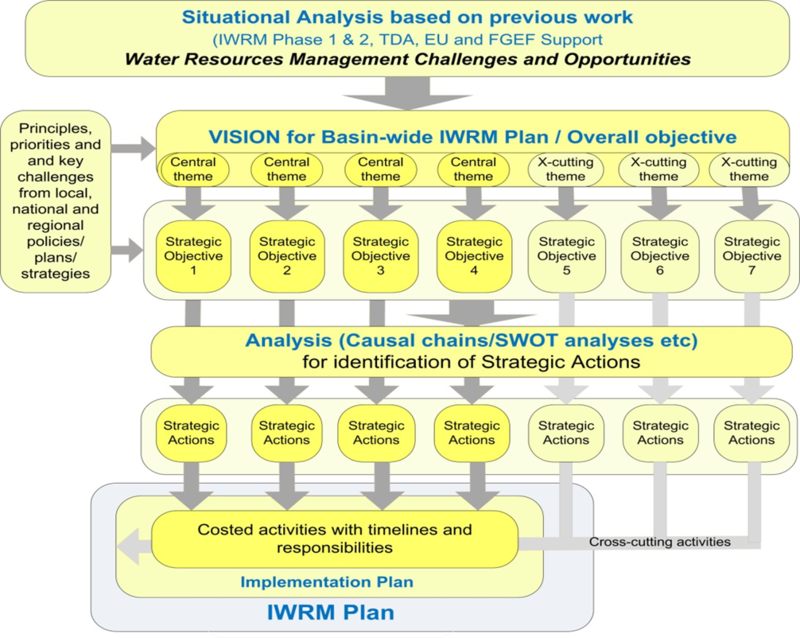 As can be seen from the flow chart, development of the plan is built on a Vision of IWRM for the basin and associated themes and strategic objectives. Preliminary work derived seven themes, four considered as “central” and three as “cross-cutting”. These themes are only preliminary and will be finalised through consultation with key stakeholders. To date work has focussed on trying to consolidate these themes and to ensure that they reflect a Vision of IWRM for the Orange-Senqu Basin. Consultative processes have been initiated to ensure that progress is made towards consensus on the Vision and strategic objections that would guide further development of the Plan. Despite the fact that an IWRM Plan for the basin has been on ORASECOM’s agenda for many years, a vision of IWRM for the basin remains absent. Such a vision is necessary to provide direction for the IWRM Plan. It is generally agreed that the overall objective for the IWRM Plan; agreed at high-level stakeholder workshop (“Delphi process”) in 2011 provides a good point of departure for the visioning process. This, the seven provisional themes already introduced above, an overview of various initiatives, plans; strategies, agreements and treaties were used by the Regional Working Group to carry out a visioning exercise in Pretoria in October 2013. The details of this process are provided in a comprehensive workshop report. Participants in the workshop first critically examined the seven provisional themes and came up with suggestions for both revisions and additions. They then developed goals on which the Vision statement could be based. These are summarised in the table below. Sufficient capacity and institutional strength to ensure realisation of goals 1–4. Sufficient level of stakeholder participation to ensure realisation of goals 1-4. Appropriate financing mechanisms in place to ensure realisation of goals 1-4. In the above table the four central themes are maintained. However, there are now five “enabling” themes (previously referred to as three “cross-cutting” themes). Two genuinely cross-cutting themes have been added. It is proposed to adopt these themes and goals for taking further in development of the IWRM Plan. A well-managed water secure basin with prosperous inhabitants living in harmony in a healthy environment. There was some discussion as to whether there was a need to explore possible slight amendments or rewording to provide a stronger emphasis on sustainability and development. This could still be considered but it can be argued that “well-managed’, “secure” and “prosperous” adequately capture the ideas of sustainability and development. It should be stressed that the Vision statement does not aim to state how or what has to be done for the envisioned future state to be achieved. The identification of those mechanisms will be achieved through consideration of what actions are required to realise the goals. The above Vision Statement has been proposed for approval by ORASECOM. Promote adaptive management and effective monitoring and evaluation systems.